The price of bitcoin on the CoinDesk Bitcoin Price Index (USD BPI) remained below $500 on Friday 28th March, amid continued uncertainty over whether the Chinese government would seek to prohibit banks from working with digital currency exchanges. Sources in China indicated that the reports, which first surfaced on 27th March, appear to be true, though the People’s Bank of China, the country’s central bank, has yet to give any formal indication that its position on bitcoin and other digital currencies has shifted. At press time, the price of bitcoin had recovered slightly from an open of $478.16 on the CoinDesk USD BPI to $488.17, a rise of just over 2% or $10. The most recent decline began at roughly 13:00 GMT on 26th March, when the price, then holding at $588, dropped rapidly to a weekly low of $477 at 23:00 GMT on 27th March. The drop was caused by a report from China-based news source Caixin about China’s possible policy change. The media outlet has not retracted its story. One potentially troubling sign was that the PBOC has not yet come out to debunk the news, as it did on 21st March when China-based microblogging site Sina Weibo published false rumors that bitcoin would soon be banned in China. The PBOC has yet to make a similar announcement regarding this latest news. Speaking to CoinDesk at CoinSummit, BTC China CEO Bobby Lee indicated that China’s current policy motive is to ensure its nationalized banking system stays healthy by keeping the volatile digital currency bitcoin separate from mainstream businesses. Further, Lee said he has been trying to convince the Chinese government to regulate exchanges, issue licenses and establish best practices for the industry. 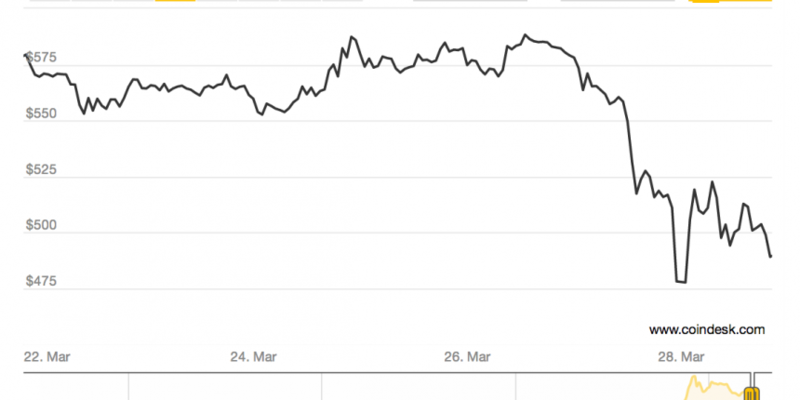 The CoinDesk Chinese Yuan Bitcoin Price Index (CNY BPI), introduced on 26th March, has observed similar declines, falling from ¥3,603 at 13:00 GMT on 26th March to a low of ¥2,849 at 23:00 GMT on 27th March. At press time, the CNY BPI had increased nearly 5%, or ¥140.87 from the day’s opening price of ¥2856 to reach ¥2,996. 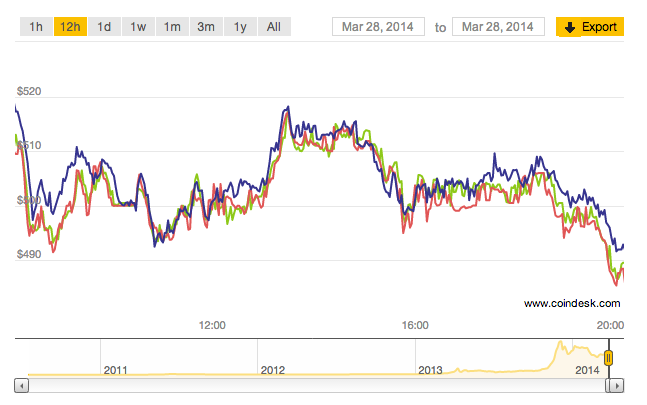 The CNY BPI tracks price movements on BTC China and OKCoin. At press time, the price of bitcoin across the three USD BPI exchanges – Bitstamp, Bitfinex and BTC-e – remained below $500. Bitfinex displayed the lowest selling price of $488.50, slightly below the $489.50 observed on UK-based exchange Bitstamp. 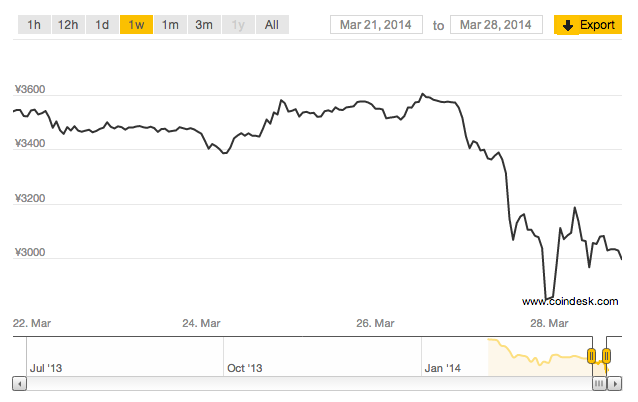 BTC-e prices were the least affected by the decline, having fallen to $492.90. 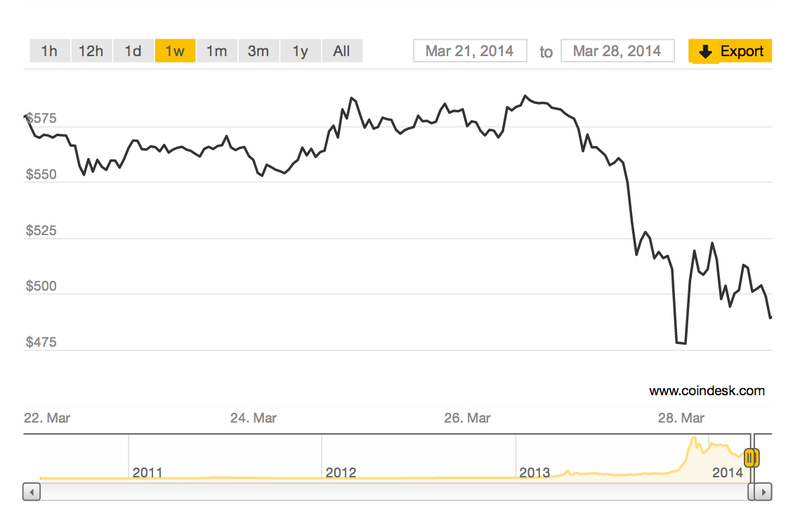 CoinDesk continues to monitor the developing China story. For more details, read our initial report here.